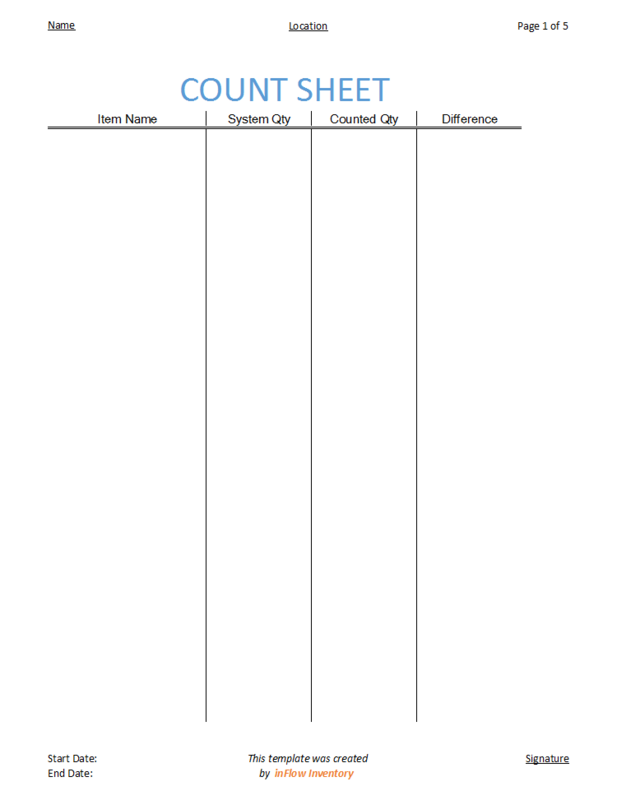 Boy, have we got a count sheet template for you — and don’t worry, it’s way better than counting sheep on your hand. But we’re not just going to give you the template today: we’re also going to talk a little bit about what the sheet is supposed to do, and why you’ll want to use it. The physical count sheet is the simplest part of a physical inventory count. To get everything started, you’ll want to first download our inFlow Count Sheet template. This spreadsheet is going to help you count all of the products in your storage location of warehouse, so that you can ensure that your records reflect what you actually have on-hand. There are a number of reasons that records can go astray over time: stock adjustments might have mistakes in them, purchase orders could be placed in the wrong location, and items can break or be stolen. Doing a physical inventory count is an important part of ensuring the accuracy of your inventory system, and it’s just as important as buying and selling new product. If your counts stray too far from reality over the course of a year, you could find yourself unable to fulfill a big order for an important customer, or end up over-ordering new stock when you still have plenty left over. Count sheets are also useful because they can create a snapshot of your inventory levels as of a particular date. This can be useful for later comparisons, like when you want to compare how much stock you were left with at the end of last quarter versus this quarter. How often you do these counts is up to you and your business. Larger shops can defer physical inventory counts for up to a year, because of the amount of preparation and work required to execute a count properly. However, you might even consider doing counts every three to six months, to further ensure the accuracy of your inventory. How do we prepare for a physical count? The biggest obstacle in preparing for a physical count is finding the right time to do it. In order for the count to be accurate, you’ll need to shut down your operations so that no stock goes in and out of your storage area or warehouse. This means you should close out any pending sales orders, and make sure not to accept any new stock on incoming purchase orders, until the count is done. The end of a standard business day, or even the end of a week, is a pretty good time to start a count. Some businesses will run complete inventory counts overnight so that the warehouse is up and running by the time the store opens the next day. Depending on the size of your storage area, you might also want to create one count sheet per section. You can divide a warehouse into aisles or lots, and send specific people to count the items in those areas. This kind of division of labor can make the whole process much faster, since you can count multiple areas of the warehouse simultaneously, without the fear of double counting. Decide which area of the warehouse the current count sheet will correspond to. Place this info into the “Location” field at the top. Pull the item names from your product list and paste them into the “Item Name/SKU” column, and then paste the current quantities (according to your records) into the “Recorded Qty” column. Print the count sheet out and make sure all pages are printed properly. Fill out the name of the person assigned to this section in the “Name” field. Write the current date into the Start Date field in the footer. This is really more to help for record-keeping in the future, so that you’ll know what day this count sheet was from. The person who signed in step four should now begin counting their section of the warehouse, one item at a time. The final tallies for each product should be placed in the Counted Qty column. When you’re done with counting, you can calculate the “Difference” column by subtracting the Counted Qty from the Recorded Qty. You’ll also want whoever is in charge to sign the footer and record the End date. Once all values have been finalized by the count, you’ll then go back to your master stock list and adjust your records according to the Counted Qty from the sheets. This will ensure that your records are completely in step with your actual inventory levels. If you’d like to make this process even more efficient, create your count sheets in inFlow Cloud. The Recorded Qty can be pre-filled for you, since inFlow tracks your current stock levels, and the differences are calculated automatically as you enter the Counted Qty.